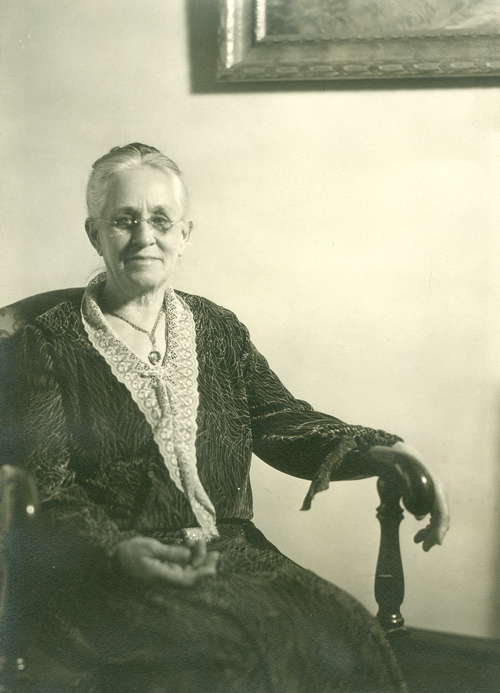 For Women’s History Month, the River Valley Pioneer Museum celebrates Martha Elizabeth “Lizzie” Winsett Johnson (1859-1939). Born in Tennessee, Lizzie was a life-long faithful member of the Baptist Church, which strongly condemned the use of intoxicating spirits. In the mid-1880s, Lizzie, her husband, and their children moved to Kiowa, Kansas, where she became active with the Women’s Christian Temperance Union (WCTU). In 1892, Lizzie and her family settled in Canadian. Concerned by the abundance of saloons and apparent alcohol abuse by local citizens, Lizzie enlists other women to join her in organizing a local chapter of the WCTU in late 1902. In 1903, the WCTU influences the City Council to vote Canadian dry, and in 1908, the County Commissioners vote Hemphill County dry. Lizzie served as president of the local chapter of the WCTU from 1902-1903 and then 1904-1939. Lizzie was also an accomplished painter. She was probably the first trained artist to reside permanently in the region. She studied under several artists in Nashville, Tennessee, before moving to Kansas and Texas. She continued to paint throughout her life and taught art while living in Canadian. The River Valley Pioneer Museum has one of her works, Joan of Arc Led to Her Death, on display. I am embarrassed to admit that this exhibit is not ready yet. This year started out with a bang and we have been sprinting ever since! Every time I turn around, something has come up, like a complete kitchen remodel, banquets, preparing for a county-wide membership drive, and more. I’m playing catch up, and that’s an amazing feeling! The museum is so busy that I’m behind! I sincerely hope to have this exhibit ready for viewing in the next two weeks. We are now open on Saturdays, 10am-2pm. So, no excuses not to stop by and see us!